Plan a day out skiing and snowboarding at these ski mountains near Saratoga! West Mountain is a great destination for locals and tourists alike as it is the only ski resort in the immediate area! It's just half an hour from Saratoga Springs, so it's easy to hit the slopes when the snow falls. West Mountain offers 30 trails and even a snow tubing park. Gore Mountain has 14 lifts and 110 trails. If it is your first time up the mountain or you just need a tune up, Gore Mountain's Snow Sports School is a great place for you or your family to take lessons no matter what your age or what your ski/snowboarding level is. This is a small mountain that is packed with family fun! Just a short drive from Saratoga, this mountain offers everything you need for your outdoor adventure. The mountain is open Tuesday through Sunday, and the tubing park is open on the weekends. Come visit the Olympic Mountain! The best in the U.S come here to train and compete, and it is also a place where kids can learn and have fun. When you are at the top of the 4,000 foot mountain, make sure you take in the views of the surrounding Adirondack Mountains. Discover Oak Mountain and all it has to offer! 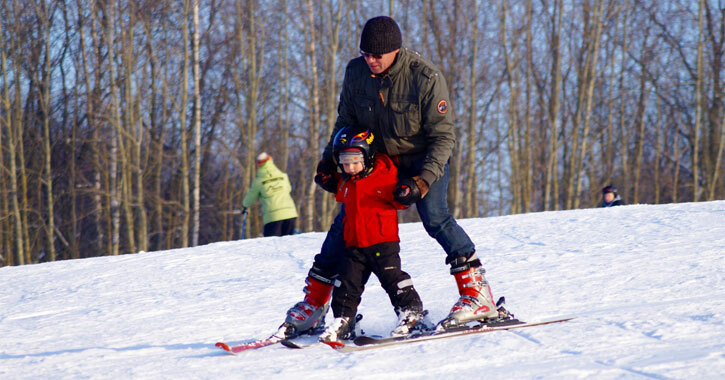 With great skiing, snowboarding and tubing conditions, Oak Mountain is fun for the whole family. Jiminy Peak can offer you more ways than one to enjoy your winter vacation! It is a full-service mountain that can offer you an array of recreation, lodging and entertainment options. They have 44 trails that are open for day and night use, equipment rentals and lessons for all ages. When you are not on the mountain, you can relax at one of their beautiful lodges. Considered a family-friendly mountain, Bromley is a place where everybody knows your name. The slopes here are kept in top shape and the mountain has a lot of intermediate terrain with some challenging terrain on the "East Side" of the mountain. It's a perfect weekend getaway destination for the whole family! Killington resort consists of 6 mountains that offer 155 trails and 73 miles of terrain. But don't worry about waiting in line because Killington has an extensive lift network! After a long day of being on the mountain, you can sit and relax at one of their lodges or maybe even get pampered at one of their spas. Stratton is a mountain resort that can offer you freedom to explore nature with amazing amenities. You can take a gondola ride up to one of their trails or walk around and shop in the village located conveniently at the bottom of the mountain.